The maturity and depth of the sounds presented by this New Jersey quartet make it had to believe that Plum is The Yarrows' debut. The maturity and depth of the sounds presented by this New Jersey quartet make it had to believe that Plum is The Yarrows' debut. 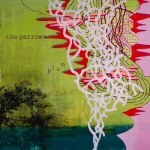 Though not really sounding like either artist, the Yarrows' slow-burning songs are couched in a hazy beauty you might find on an album by Wilco or The Flaming Lips. Album opener "Your Perfect Mouth" is a terrific example, the song starts simply and gradually becomes a wonderful, swirling funnel cloud of sound and expression. The initially more countrified "You're Cruel" follows and is arguably the best cut on the album -- the song has a sweet, dreamy shuffle to it before an instrumental break a little less than halfway through transitions the tune into a more present, insistent, artful rock song. The melodic "May", expansive "Nobody Knows You're Gone", and "Lie Awake" are other highlights on an album not short on highlights. Plum is a record not to be overlooked or missed.